Igor Kuperman is one of the most respected hockey historians and aficionados in the game today. A dual Canadian and Russian citizen, Kuperman left his native Soviet Union in the 1990s to work with the Winnipeg Jets as one of the very first Europeans to be associated with an NHL club front office. He followed the franchise when it moved to Phoenix, Ariz. in 1996, before becoming a Toronto, Ont. resident in 2004. 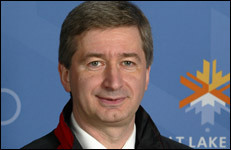 Kuperman was also assistant GM of the Russian team at the 2002 Olympic Winter Games in Salt Lake City, Utah, where his squad claimed a bronze medal. He was manager of the Russian team that played in the 1996 World Cup Of Hockey and was GM of Team Russia during Igor Larionov’s farewell game in 2004. In addition, Kuperman was the NHL consultant during The Stanley Cup’s first visit to Moscow in 1997, is the co-author of the IIHF’s 100-Year Anniversary Book, published in 2008, and in the same year was instrumental in the launch of the Kontinental Hockey League (KHL). He is currently vice-president of European Operations for Pointstreak Sports Technologies, Inc.